Here's what a stereograph looks like. We recently received a collection of miscellaneous Michigan photographs, stereographs and postcards at the Clarke. 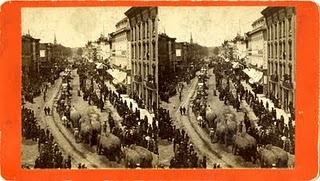 One of the stereographs is of a circus parade. It is an image that was part of a group of images entitled Kalamazoo Views. Stereographs were actually two images taken from almost the same angle so when viewed through lenses the image achieved a near 3-D effect. 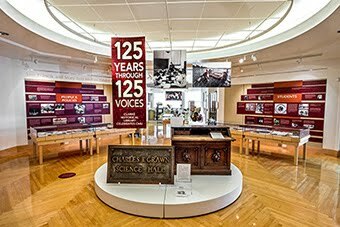 The Clarke has a collection of 7 boxes of stereographs documenting Michigan history. Here is a closeup of one image. 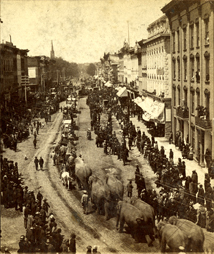 The photographer of the circus parade was Schuyler C. (Colfax) Baldwin of Kalamazoo. The floats lead the parade and 7 elephants are at the rear. There may have been more who didn't make it into the photograph, I don't know, nor do I know which street the parade was on or the date. Large crowds are in evidence, some looking out from nearby windows or balconies. Baldwin lived 1823-1900 and photography began in 1843 so it was taken sometime between 1843 and 1900. My guess is that this is late 19th century. Enjoy the view.